Growing Food Forward harvested 72 varieties of produce on Oct. 16. The haul yielded 364 pounds of food for hungry folks in the Roaring Fork Valley and Colorado River Valley. The Roaring Fork Valley has a mushrooming number of food producers, several renowned growers willing to share their expertise and land for budding farmers. It also has healthy demand for food from consumers ranging from high-end restaurants to hard-up food pantries. What it lacks is a hub where resources can be paired with needs. That’s in the process of changing. An organization called the Roaring Fork Food Policy Council aims to establish a food hub where both food producers and consumers could go for information and assistance. Council Director Gwen Garcelon envisions endless possibilities for the hub. For example, a young couple who have outgrown their garden could check the hub’s online database to find out where land is available for lease for commercial food production, she said. In the middle of the growing season, the couple might run into a problem with insects, so the hub could help them hook up with experts at Sustainable Settings in the Crystal Valley or the Colorado Rocky Mountain Permaculture Institute on Basalt Mountain for advice on an organic counterattack. “We could be a mecca on how to grow in a difficult climate,” Garcelon said. From the consumer side, a hub could provide one-stop shopping where the chef of a high-end restaurant in Aspen could purchase a variety of greens and produce without taking the time to contact numerous small growers, Garcelon said. The hub also could alert food pantries or needy families when food was being purged from supermarkets and restaurants because of expiration dates. The hub could even provide a more practical role in food production by providing a commercial kitchen where food producers could process their raw product into a marketable commodity. Garcelon and the steering committee of the council want the food hub to cover the Roaring Fork Valley and Lower Colorado River Valley from Aspen to Parachute, but it’s not going to be established overnight. The first step is a food-hub needs analysis. The council is conducting a survey of as many people as possible in the “local food enterprises,” from ranchers, farmers, small growers and people producing food products to pantry operators, chefs and nonprofit organizations connected with food production and nutrition. The survey can be found at http://www.roaringfork food.org. The council is urging stakeholders in local food production to fill out the survey as soon as possible but no later than the end of January. Once the results are in, focus groups will be convened to help define the steps needed to establish the food hub. At the end of a year, Garcelon hopes the council has an online clearinghouse and information center operating, at the least. A midvalley-based nonprofit organization called Growing Food Forward is a mini-model for what the food hub could accomplish. 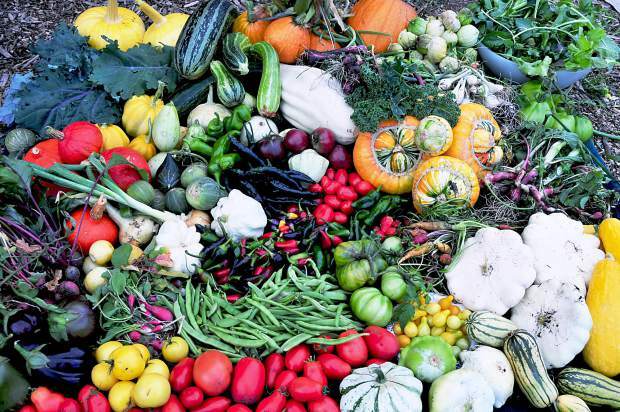 Growing Food Forward has built 102 gardens in the Roaring Fork and Colorado River valleys and produced 8,000 pounds of food this year for Lift-Up and other pantries serving the hungry, according to Director Kim Doyle Wille. Additional bounty from the gardens went directly to needy families, and family members were recruited to help with weeding, watering and harvesting, she said. A final 500 pounds of potatoes, onions and squashes harvested from local gardens will be donated to the Carbondale Lift-Up soon after Thanksgiving, Doyle Wille said. In addition to producing food from its own gardens, Growing Food Forward provided seeds to people to plant in their own gardens in return for a pledge to share their crops. Next year, Growing Food Forward aims to produce food in 500 gardens operated by itself or volunteer gardeners, according to Doyle Wille. People who cannot grow food on their own can volunteer with Growing Food Forward. “There are any number of ways to get involved in the food movement,” she said. Doyle Wille said matching supply and demand of locally grown food on a larger scale is a great goal. She applauded the food council’s direction. “It would help tremendously,” she said.